Poppin' Cookin' SG! 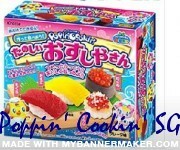 : Popin' Cookin' Kits!!!! Popin' Ramen & Dumpling Set! Popin' Cake & Ice Cream Set!! This is basically what each set would contain. You can mix and match the sets. Selling each set for SGD$9 inclusive of shipping and normal postage! Registered postage is an additional SGD$2.24. We will not be responsible for any loss of products through normal postage. 1 set weighs about 250g. Email us @ PoppinCookinSG@gmail.com for orders of more than 10 sets and if you have any queries. If you wish to see tutorials on how it is done, check out RRcherrypie on Youtube!